Rockies player Trevor Harris throws a strike. On Sunday, Mission Valley Rockies hosted Helena and the Clark Fork Cougs. The game against Helena was initially schedule for Saturday but was cancelled due to rain. Helena defeated the Rockies 21-11 and in the second game against Clark Fork the Cougs outscored the Rockies 21-4. The Mission Valley Mariners were on the road on Tuesday, June 19, in Whitefish to face the Glacier Twins in a conference double header. The Twins swept the Mariners 5-3 in the opener and 6-0 in the night cap. 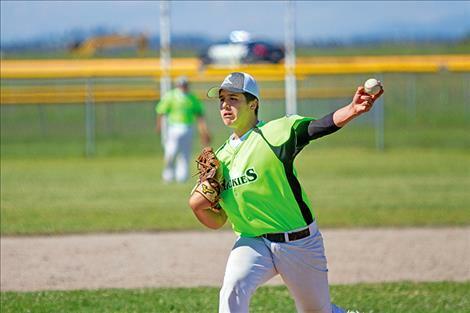 On Thursday, the Mariners traveled up to Libby to play in the three-day Libby Big Bucks Tournament. The Mariners went 3-0 in bracket action outscoring Northern Lakes 4-1, slipping past Moscow 3-2 and clubbing the Cubs 10-1 to advance to the championship against Walla Walla. In the championship game, the Mariners fell 11-4 to Walla Walla. On Thursday, the Mariners will host the annual Firecracker Tournament. The Lil’ Lakers 10U softball team won the Frenchtown Fury Summer Sizzle Championship this past weekend making it their third tournament championship in as many weeks.